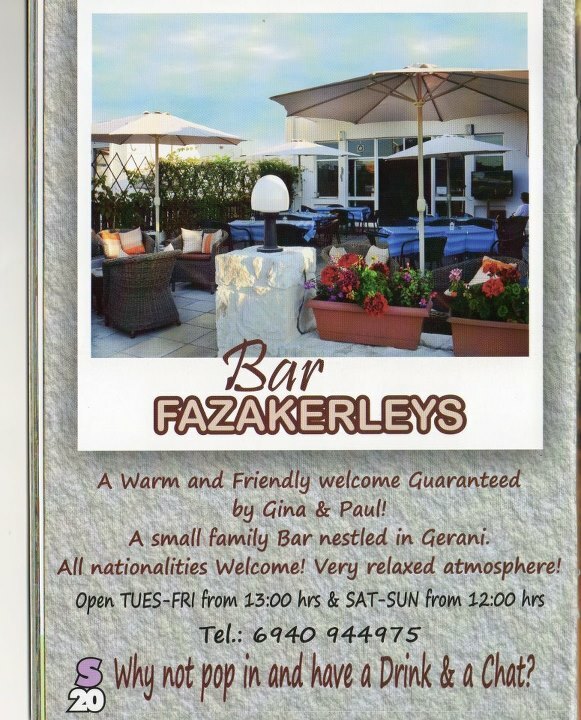 Paul and Gina started running Fazakerleys in 2011 after moving to Crete from the UK. Offering a warm and friendly welcome to everyone they are open Tue-Sun all through the year, come rain, sun or storm. Living in the village of Gerani they can offer advice about local attractions as well as the sights further afield that you may wish to see during your visit to Crete. There is almost always something going on at Fazakerleys, from sports on the big screen TV at the weekend to the quiz night on Fridays. The bar is available to use for your party too. Just ask Gina or Paul for details. Always available for a chat to their customers, why not pop in for a drink and say hi. Weekends - Sport...UK Premier League Football, Rugby, Motor Racing, Tennis. Just ask and they will do their best to find it for you. All sport available on the large screen projector. Just ask at the bar. Why not visit their Facebook page for up to the minute information on what is going on.